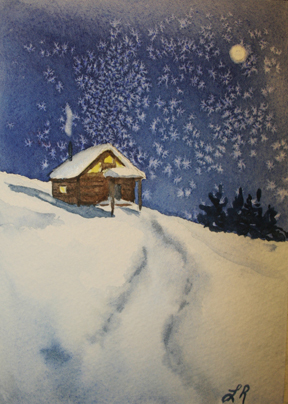 Wishing everyone the best this Christmas season and into the New Year. I completed this painting awhile ago but wasn't sure if I was ready to post it. I tried to put it up on Facebook and the only respones I got were from close friends. Then another friend called me that had seen it, was worried, and asked if I was okay. Yes, I am fine. It did make me realize that most people want pretty pictures and this one can be a little disturbing. Let me explain though. It is a self portrait. I did it over the summer as part of my studio project for my Masters. Part of my doing the program was to do something for me. I wanted an excuse to paint how I felt about things instead of what I usually paint. Something a little more conceptual. I also wanted to see if I could paint a portrait in egg tempera. 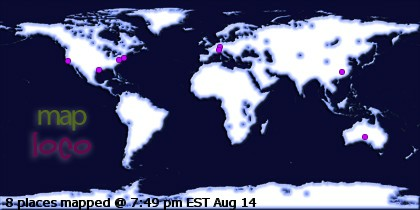 Of Atlas' Woes is my biggest accomplishment of this past summer. To explain it briefly: What looks like a scar on my shoulder is actually a map of the world. I chose to make it look like a scar because when a crisis happens in your life and you feel like the weight of the world is on your shoulders, it does change (or scar) you. 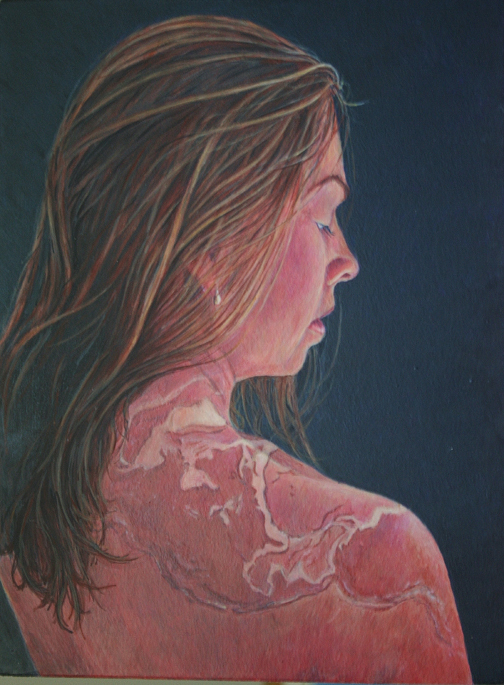 I have gone through several crises the past few years and it was affecting my health. My neck and shoulders hurt constantly and it was explained to me by a massage therapist that the pain was a manifestation of how I felt. I did feel like the weight of the world was on my shoulders and I felt that there wasn't anyone in my life that could help lift that burden. Wow! She told it like it is. So, this was my attempt at letting my loved ones know how I felt and hopefully relieving some of the pain. Tomorrow (Thursday) will be my first online course through WizIQ. 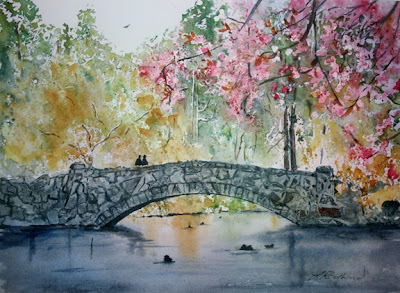 I will be teaching how to do the above scene in watercolor. The course is at 2pm EST or 11am PST (for all you west coasties). To join in the session, please click here. It is a free course but you do have to sign up through WizIQ. Since it is my first time teaching through this platform, please be kind. I might get lost every now and again trying to figure out what to do. It would actually be a great help to me to have a few people that I know there cheering me on and laughing with me over my mistakes. I do hope that you will join me! I can't believe I forgot to post this painting!! It sold to a very good home recently and when I went to look for it here on my blog, I realized that I didn't post it. Silly, busy me. 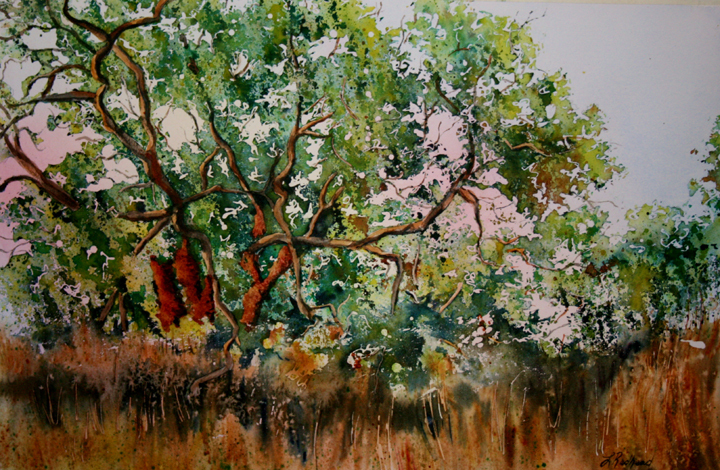 The painting is from a workshop I taught this past spring from my Iris Period. (Hey- Picasso had a Blue Period - I can have an Iris Period) It was during my Iris Period that I painted many paintings of Irises. 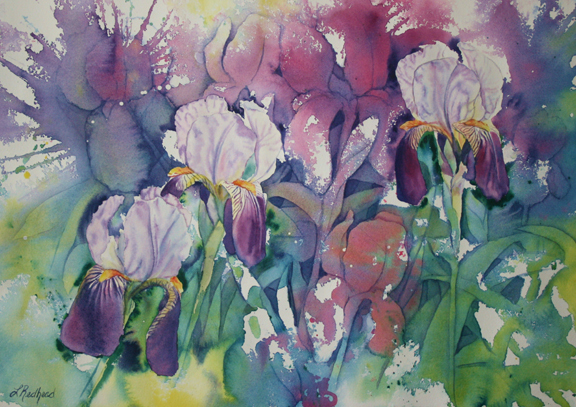 This lovely painting of irises in a garden, titled Iris Garden is now available as prints on paper or canvas and as cards on Fine Art America. 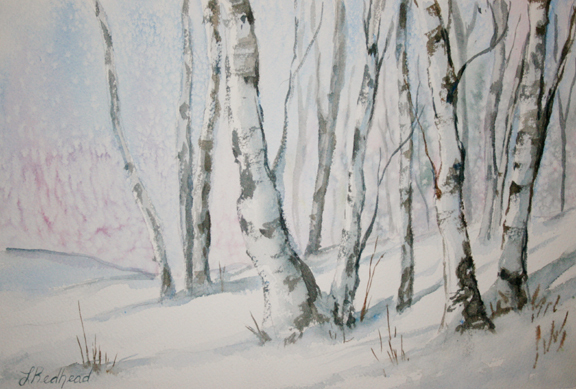 My work can now be purchased as prints on Fine Art America. Fine Art America will print my images on canvases or paper then ship them to you. Cards may also be purchased. Be sure to check back often though! 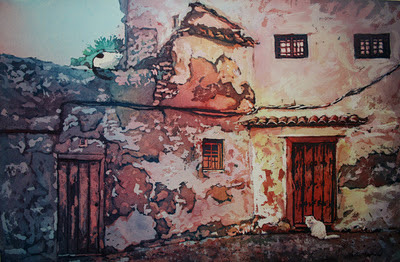 I will continue to upload more images of my paintings in the future. Garden Delights is one of the paintings that was accepted into the Food for Thought exhibit and will be on display through next week. I have been wanting to paint crystal for some time. 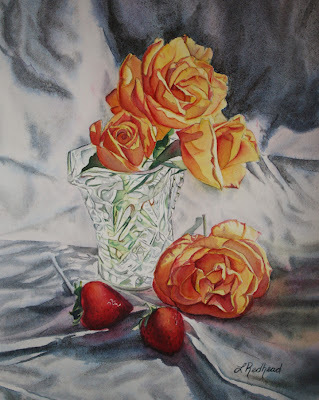 Then I discovered a beautiful rose bush in the garden of my new home and it gave me the excuse to paint this crystal vase. The crystal has opened a Pandora's Box of sorts. Now I have friends handing me their crystal and asking if their piece has a place in my next painting! So many ideas and not enough time. . . It is a good thing I am teaching a workshop on crystal at the end of October. 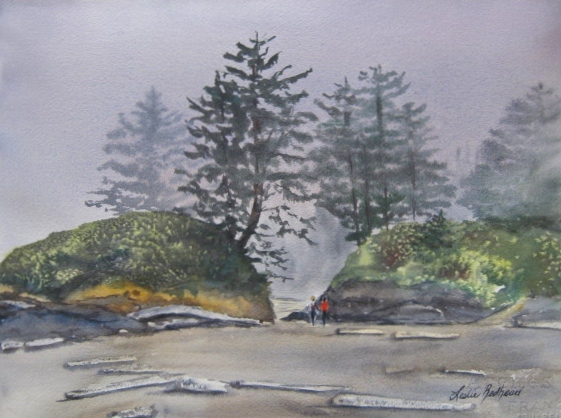 The workshop is October 22-23 at the Ocean Wilderness Inn near Sooke, BC (west coast of Vancouver Island). It is $140 for the workshop only. Lunches and lodging are additional. Commuters are welcome. 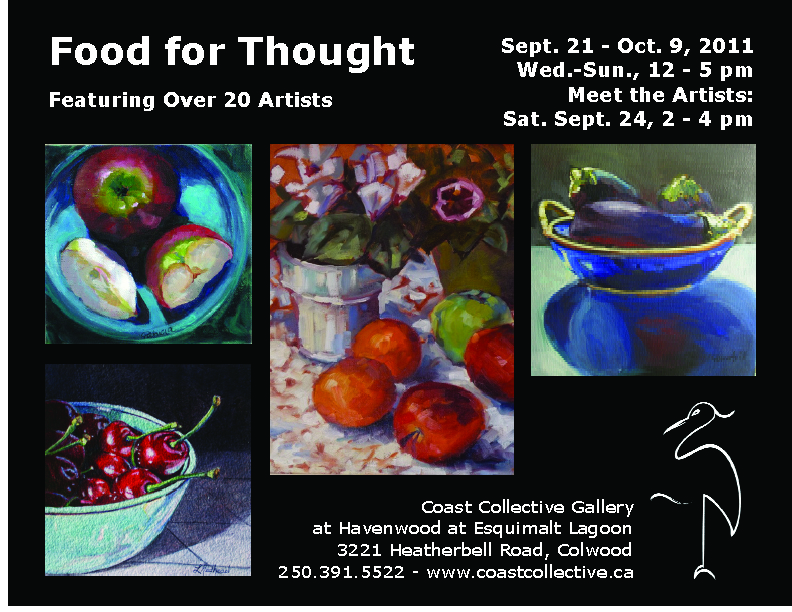 Starting tomorrow, three of my paintings will be on display as part of the Food For Thought exhibit at the Coast Collective Gallery. 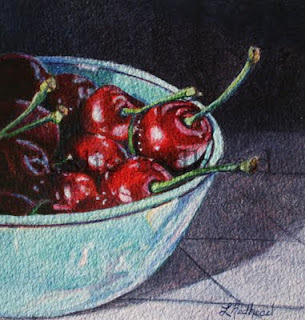 I was pleased to see that my Bowl of Cherries painting not only made it into the exhibit but on the poster as well. Woohoo! The Coast Collective is open Wed-Sun, 12-5pm. 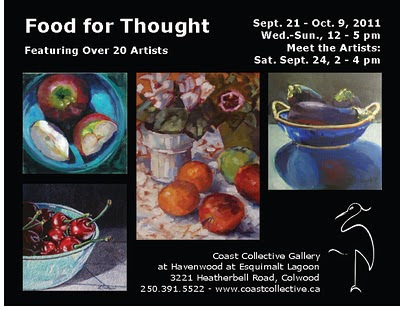 Hopefully some of you can make it out there to see my paintings and works from many talented Victoria artists. This past week I taught a workshop at the fabulous April Point Resort &Spa on Quadra Island, BC. The weather was the best it has been all year! My mother was visiting from Idaho so we went to the island a day early to explore the sites. 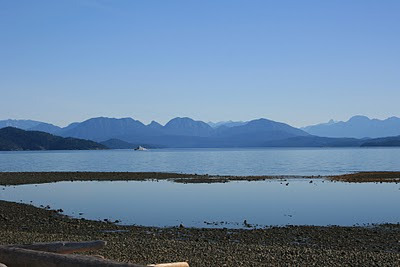 We took a walk on Rebecca Spit and visited the museum at Cape Mudge. The workshop was Fun with Watercolours which is one of my favorites to teach. It is all about playing with the paint. 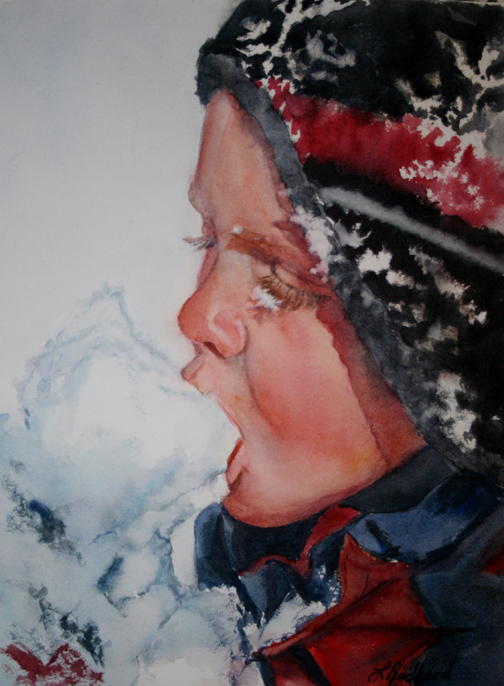 I start out with pouring, blowing, and moving the paint around the paper with my fingers. Then I show how to do some negative painting. Everytime I do the workshop, I try to have a different theme. 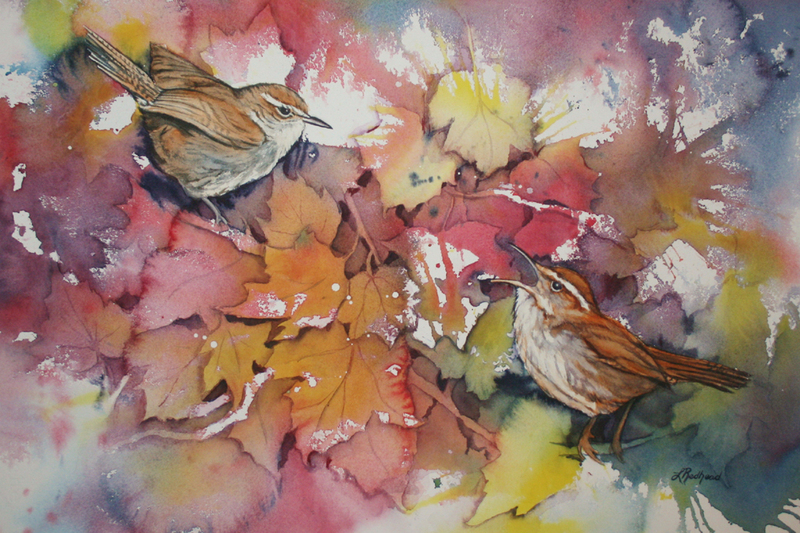 This time it was birds and autumn leaves. 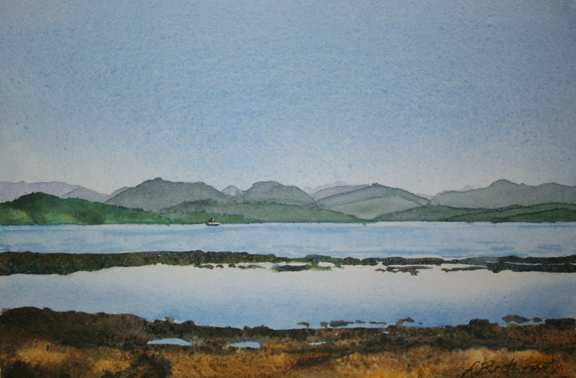 I have done seastars, crabs, a heron, and flowers in the past. After we have fun pouring the paint, I then show the class how to find the leaves and bring them out through negative painting. It was nice to see some returning students and to meet some new ones. Three weeks ago I turned in my final papers and projects for the summer at UVic. Then I hopped the ferry for Vancouver, was home for 24 hrs, and then hopped the plane for Salt Lake City. There I met my brother and his family (who flew in from Virginia) and we drove up to Yellowstone together to meet my children and the rest of the family for a reunion. Spent 5 fabulous days there (without the internet!!!) before I headed off to Pocatello, Idaho to teach a pouring watercolor workshop. After two days of teaching, I met up with my kids and mother to spend a week relaxing (and shopping) with more family. Now I am back in Vancouver and trying to get kids settled into school. 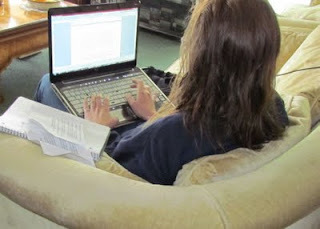 So, I am way behind in my blogs! 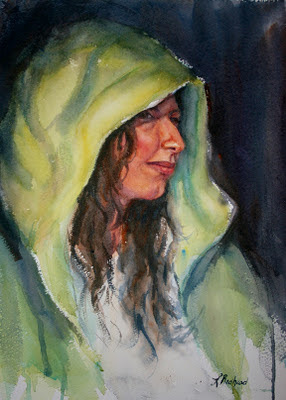 The above painting I did as the demo for my Pocatello workshop. It is an image from Virginia City, Montana which is an old mining town that is now a tourist destination. It is here that I met Rikki on the train. Rikki is from Pocatello and we got to talking and discovered our mutual love of watercolor. We ended up becoming Facebook friends and she has been watching my work for the past 3 years. 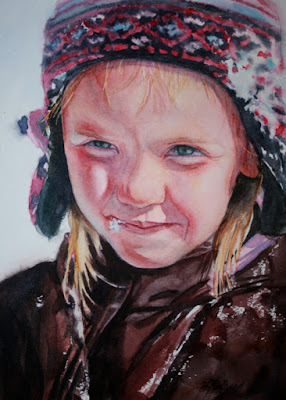 When Rikki discovered that I had family in Idaho and was going to visit this summer, she contacted the Pocatello Art Center and requested a workshop. So, thank you Rikki! 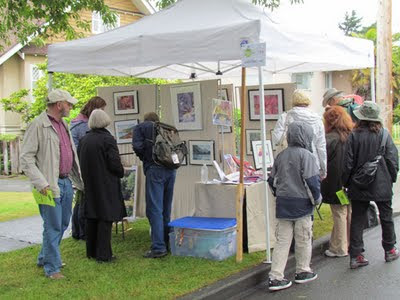 I met some fabulous people and made some new friends, including one of my blog followers, Jeanne from Allgoodart. That was exciting! I was also very impressed with the beautiful city of Pocatello. As part of my Visual Interview project for my course at UVic, I was to interpret a piece done by my studio partner, Cindy Ackland. In my previous post I mentioned that Cindy is a photographer and enjoys making photographic collages. 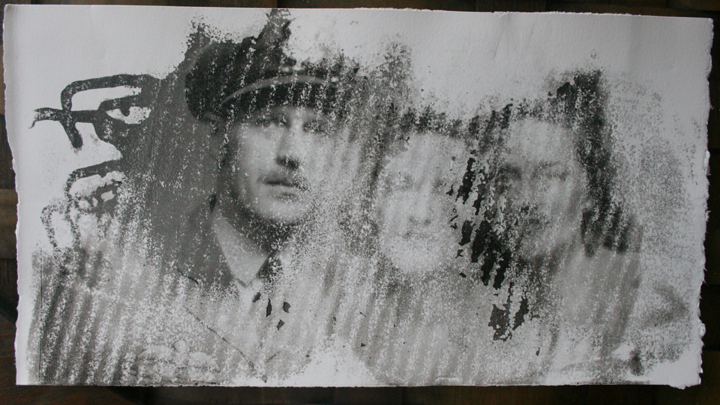 She was working with photographs of her family as she created these collages. 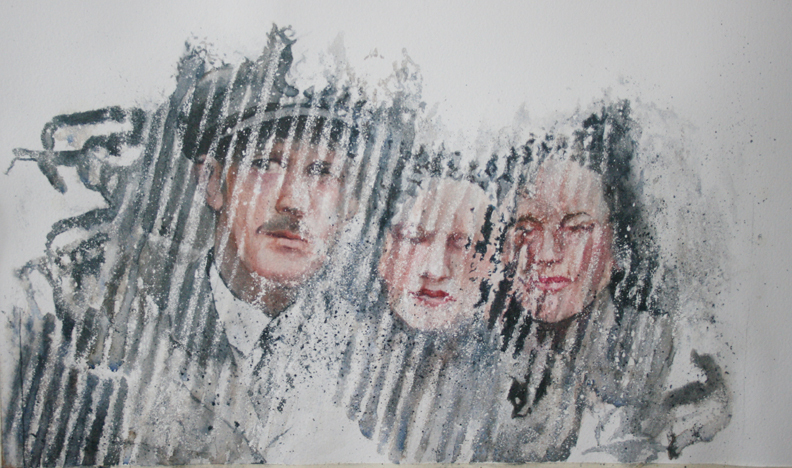 The above piece is of her grandparents. When Cindy gave it to me, she mentioned that she was interested in her grandmother's identity. Cindy felt that Bernice had to be 2 different people as she raised her family because Tom was in the military and was often gone. 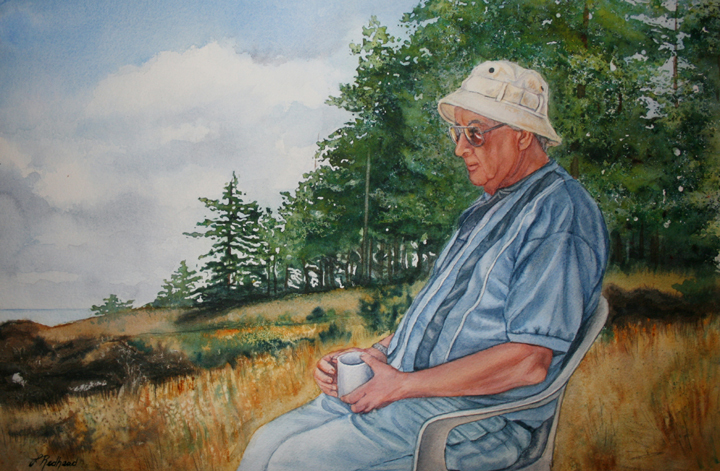 Bernice was one person while Tom was gone and a completely different one when Tom was home. When Cindy gave me this piece I immediately loved the texture and wanted to recreate it. I didn't ask Cindy for much information about her grandparents because I wanted to see if I could develop my own relationship with them through painting. 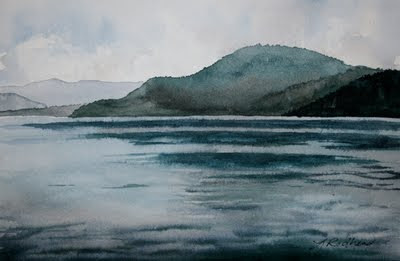 I did choose to recreate the photo in watercolor as my interpretation. I started painting the grey of the photo by using French Ultramarine Blue and Burnt Sienna because they create a wonderful grainy texture like the original transfer. As I continued to paint, I felt like I needed to add color to their faces because they started to come to life for me. Then something really interesting happened. I felt impressed to give Bernice different color lipstick. Then the Bernice in the center refused to open her eyes for me. I asked her why? Was it shame? Embarrassment? What? Finally I realized that she was being coy because her husband was present. When I discussed this with Cindy, she confirmed what I had discovered. Bernice loved lipstick and was always wearing different colors. Cindy also told me that coy is exactly how Bernice was with Tom. It was a fascinating discovery and now I want to paint some of my own ancestors and family members just to see if I have the same experience! The final project for my summer at UVic was what was a called "The Visual Interview". It was a collaborative piece with another artist in the group. We were to give a piece of our work to this artist and they could do with it what they wanted. Either work on it themselves or create another piece as an interpretation of the piece. Through this process, we were to learn about that person and gain some insight into who they are. Then we formulate 5 questions to be asked in front of everyone else. My partner was Cindy Ackland. She is a photographer and enjoys making photographic collages. At first we interpreted the interview as a fully collaborative project. Cindy has a degree in philosophy and is full of fantastic ideas. We worked well together because she had these great ideas that I was able to create. 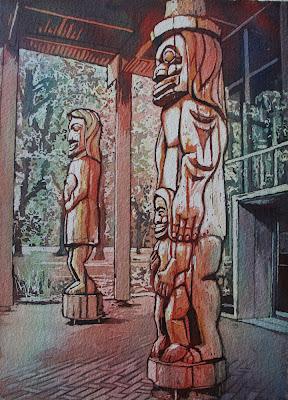 The first idea was to do a painting of the totems outside the First Nations House. 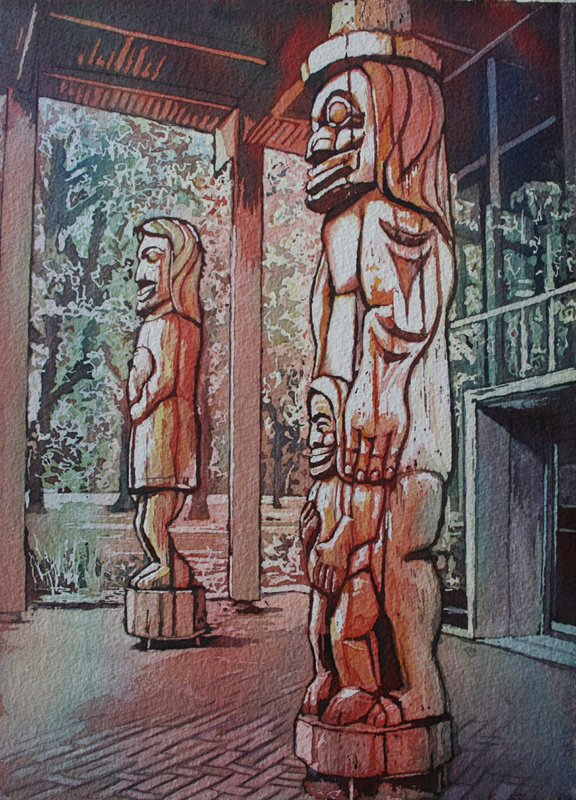 Since UVic is known for its indiginous studies and we wanted something to remind of us our time on campus, we chose these totems as the perfect subject. 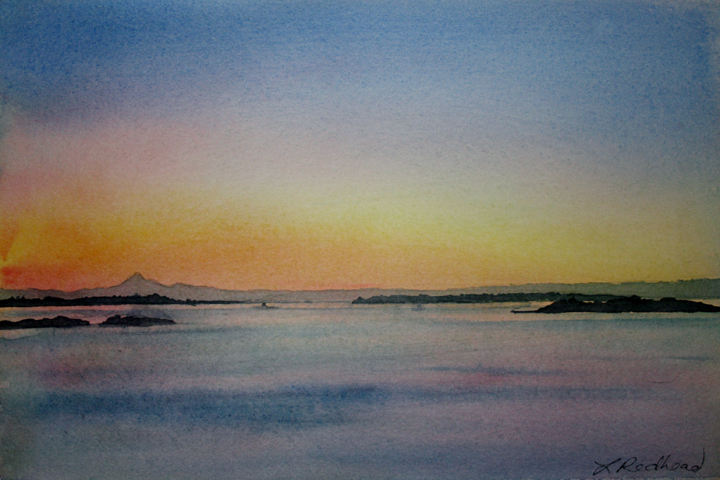 Cindy took photographs, I chose one and then I did a pour of the photograph. 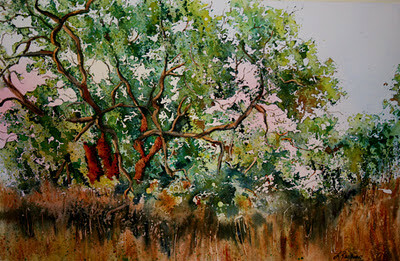 Then Cindy took the original painting, had it copied and transferred it into many forms. One of which was onto glass. (I don't seem to have a photo of that one). 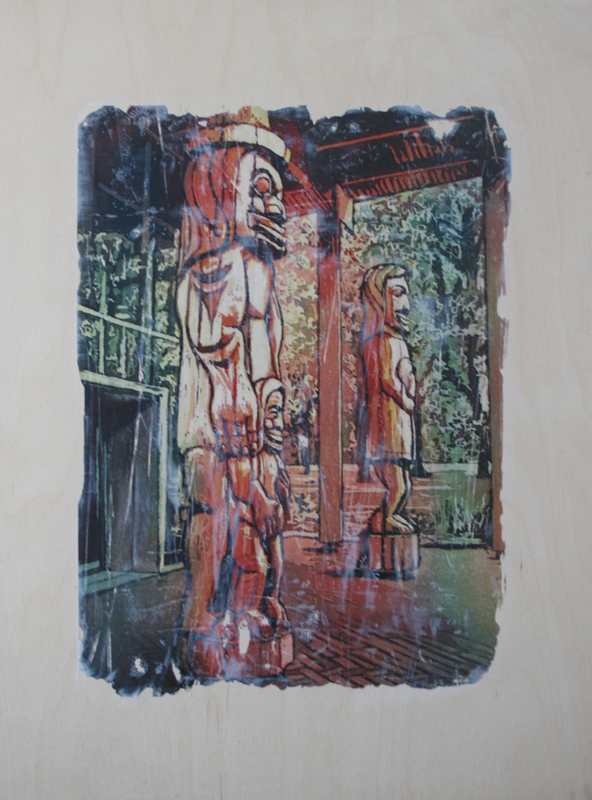 Another interpretation was to transfer it onto wood. This was my favorite. The wood showed through on parts of totems. It was so exciting to see. It also opened up so many other possibilities for me. Yeah!! 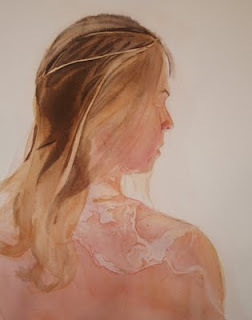 My studio class at the university this past summer was about play and experimentation. It was self directed and it was to get us thinking about what makes us creative so we can inspire creativity in others. 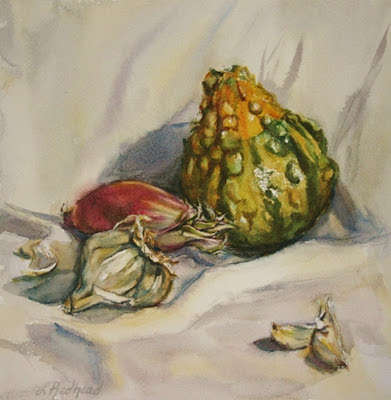 One of my goals was to do something I have been wanting to try for years- egg tempera. I have always loved the look of it and how luminous and rich it can be. For those of you that do not know what egg tempera is, it is the mixing of pigment with egg yolk. 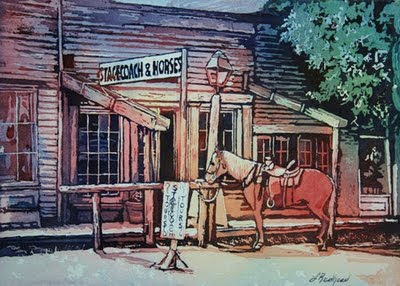 It is older than oil painting. Cherries is one of the studies that I did in the egg tempera. I experimented with a couple of different surfaces while I figured out the tempering of the paint. This is on watercolor paper. 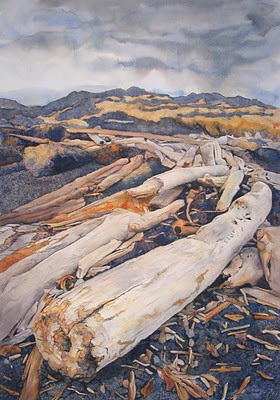 I just finished an amazing and intense 7 weeks working on my Masters of Art Education at the University of Victoria. Whew! What a wonderful journey. It has been fantastic. I met some amazing artists and educators and made some new friends. 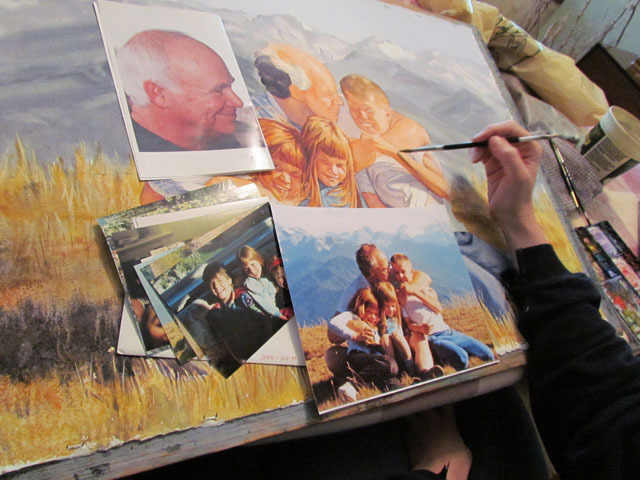 During that time I continued to work on a commission of the family above. It is complete and has gone to its new home. 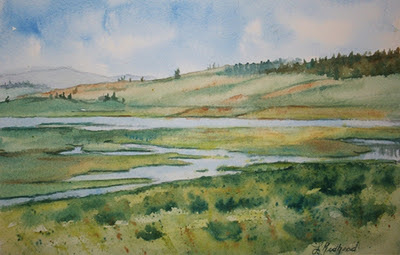 I am heading to Idaho on Sunday to visit family and to teach a workshop on pouring watercolor. I can't wait to see my children (who are visiting cousins) and to bring what I learned into my teaching practice. My hope is to tell you more about this and to show you what I have produced. I wanted to do that while I was in school but time ran short each and every day. I even pulled a few all nighters to get the papers done! But that is another story for another time. . . 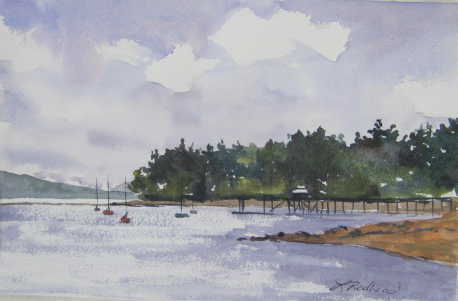 This is a quick painting I did for the Arbutus Ridge Art Club. 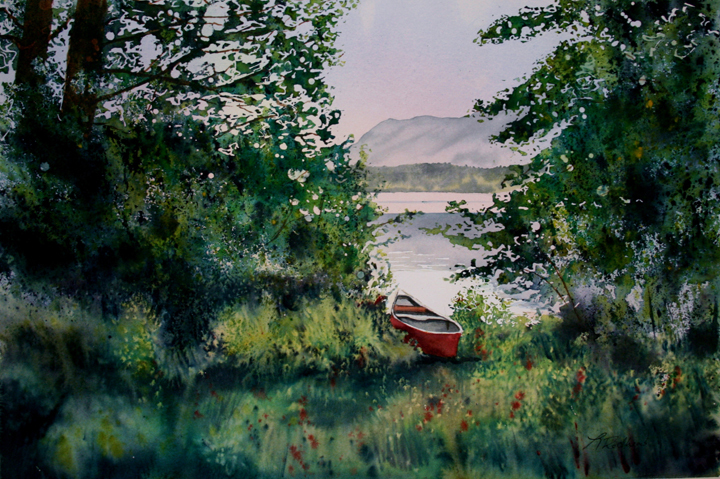 The goal of this painting was to show how to approach a plein air painting. Start small and keep it simple! A couple of weeks ago I actually took time off from preparing lessons and kids to paint this flamenco dancer. 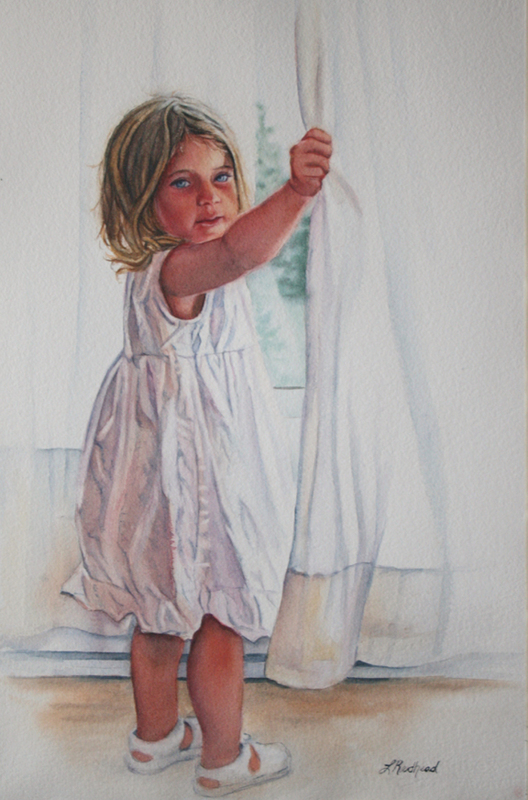 Her photo has been sitting on my desk for some time and I have been wanting to paint the swish of her dress. 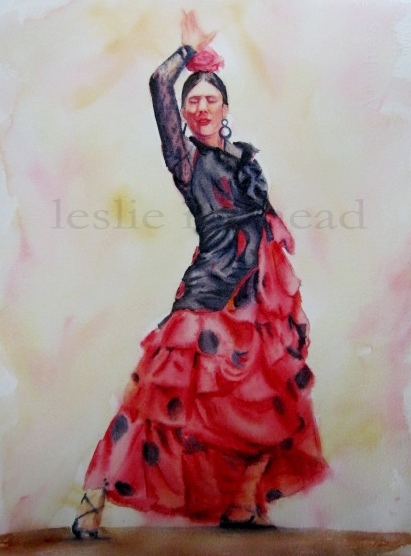 She is one of the dancers from the show I saw in Cordoba, Spain last year. 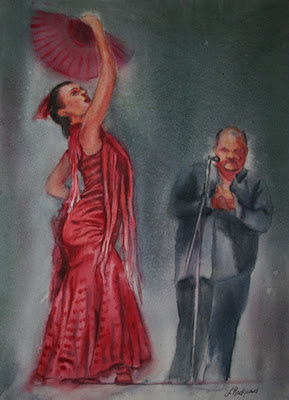 I was excited to find out that we will be returning to see another show in Cordoba when I return to teach. Flavour of Spain for more information. My garden in Victoria was always a surprise. Every spring there was something new that popped out. 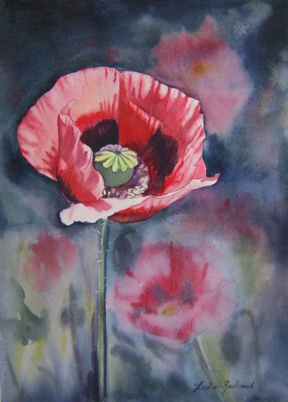 Last summer when I arrived home from Spain, I discovered my garden covered in pink poppies. There must of been hundreds of them. They ranged in size from very tiny to huge blossoms. It was a great way to be welcomed back to reality. 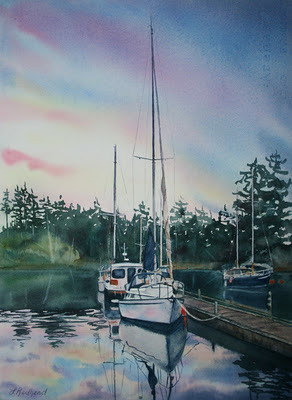 This painting was done as a demonstration for the Arbutus Ridge Art Club in Cobble Hill, BC. 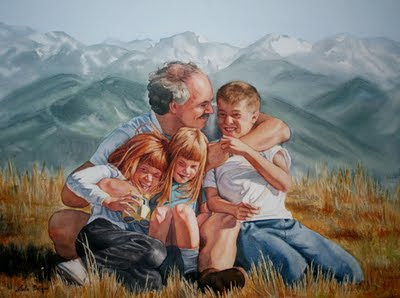 It was a wonderful group of people and I really enjoyed painting for all of them. To purchase this painting, please visit my Etsy shop or contact me. 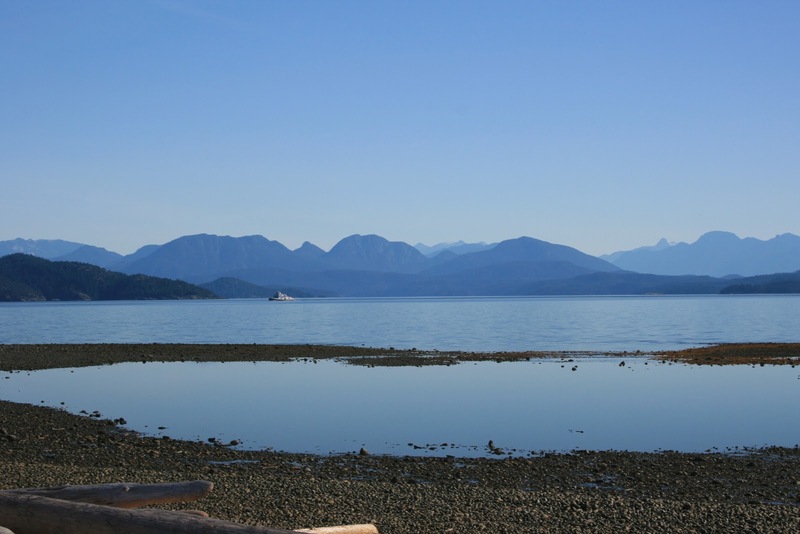 Discovery Passage is the water way between Vancouver Island and the Sunshine Coast on the mainland of Canada. 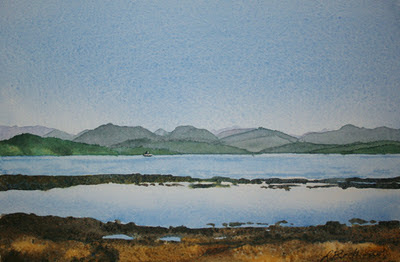 It is dotted with islands, wildlife, and cruise ships on their way to Alaska. 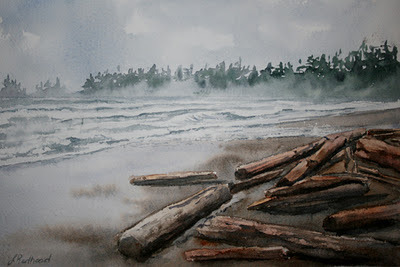 I teach a workshop in the area every spring at April Point Resort on Quadra Island. I try to teach the workshop as close to the summer solstice as possible. I love that the sun doesn't set til close to midnight and rises before 5 am. This time I watched the sun go down and witnessed a green sky. It wasn't the aurora borealis but a green sky like in those paintings of the north. When I first saw some of those paintings I thought it was just an artistic interpretation but was told otherwise. Apparently the further north you go, the more colorful the sky becomes. It was beautiful. It is such a calm and serene place to be. Perfect for an artistic getaway. Last week I taught a workshop at the Monterey Centre in Victoria, BC. I taught there weekly before my big move and was happy to be back to see all my former students and friends. 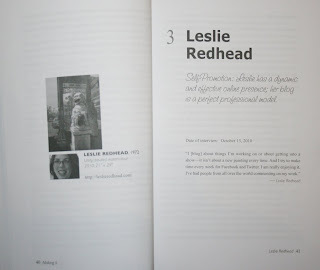 I was surprised and pleased to see some new people, including two other Leslie's. Such an awesome name for awesome people. I was also delightfully surprised with a lemon meringue pie by another awesome student and friend, Cathy. It was to go with the conversation on my Facebook page about the title for Golden Gem. Thank you Cathy for the wonderful pie. My family (including me) devoured it in minutes. Yummy. 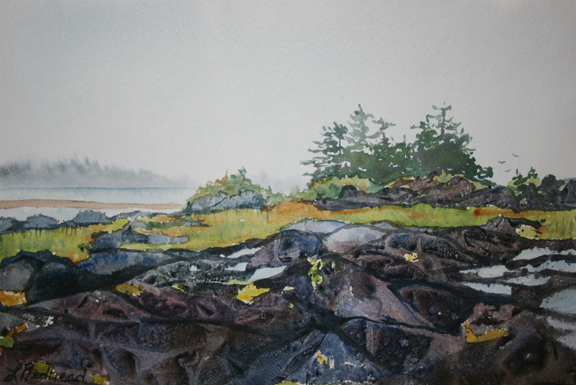 Beacon Hill Park is the piece that I demonstrated and taught. Beacon Hill is a beautiful park located in the middle of the city and overlooks the Strait of Juan de Fuca into Washington state. In one of my previous posts I mentioned that I was teaching a floral workshop just before the Iris Convention. I was hoping to complete another iris painting. Lavender Dreams is the painting that I demonstrated and nearly finished for the convention. It may not have been completely done for the exhibit but I was able to complete it during the week. 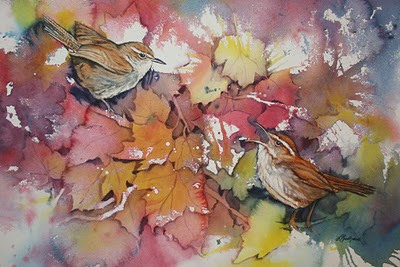 It was actually a draw to customers to be working on a painting. 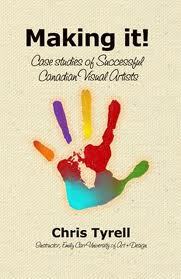 Last September I was contacted by Chris Tyrell, the author of Artist Survival Skills. He was writing a new book about successful Canadian Artists and he wanted to interview me. Me!! How awesome is that? Not only did Chris want to interview me but he wrote a whole chapter on me. 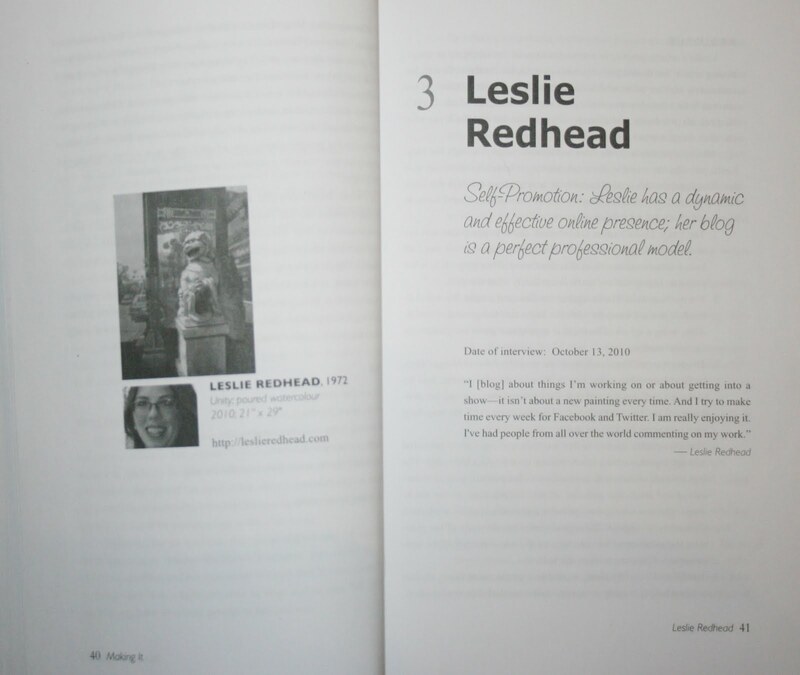 So I am Chapter 3 in the book. The reason why he wanted to interview me was that he was impressed with my blog. 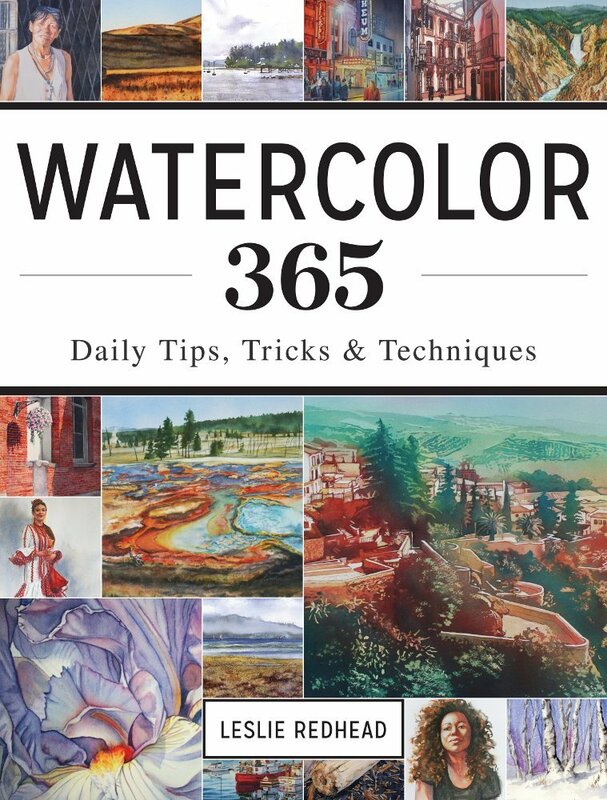 Who would have thought that my weekly and biweekly journaling of my painitngs would get me into a book? It is very humbling. I was so nervous when he interviewed me but Chris made me feel at ease and we had much to discuss. As he mentions in the book, we were friends by the end of our conversation. Chris explains in his book why he chose my blog as an example. I would tell you but you will have to buy the book to find out. My impression about Making It! was that it was going to be out towards the end of the summer. To my surprise, it came out last week. I went out with some good friends to celebrate. Hope Chris is celebrating as well. It is available through Opus Framing and Art Supplies. For more information or to purchase, please click here. I am having a great time at the Iris Convention. Many of my students and friends have come by to see the show. Thanks for all the support to these wonderful people! The above photo is of me with a great student and supporter, Cathy. I have even met a wonderful woman named Mary that has been following my blog. She came in from Sooke to see the show and to meet me. How awesome is that! 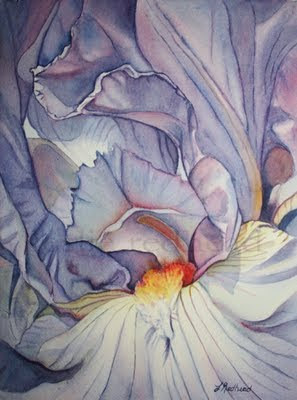 I have enjoyed meeting people all over that share a passion for the Iris. I think I am hooked on this beautiful flower. In fact, I am taking home some seeds to start my own iris garden at my new home.